While many horse owners struggle to keep their easy keepers lean, others have the opposite problem: their horses need to gain weight. Weight can be gained as either lean body tissue (mostly muscle) or as fat (adipose tissue). Muscle building can only be achieved through stimulation of the muscle cells to become bigger, which can only be achieved through exercise. Fat is easier; simply having your horse consume more calories than he expends will result in the horse storing that excess energy as fat. While this seems easy in theory, there are many things that can impede weight gain. A high metabolism, calorie-burning stereotypic behaviours such as stall walking or weaving, intense work or lactation all challenge the horse by further increasing his calorie demands, making it harder to feed above those demands. Issues such as poor dentition, parasite infestation, hormonal or malabsorption issues may make it harder for a horse to use the foods he is given efficiently and should be addressed by your veterinarian. The first step to helping a horse gain weight is to evaluate why it is skinny in the first place. If the horse had been starved, such as often occurs in rescue animals, you will need to work with a nutritionist and veterinarian closely to avoid ‘refeeding syndrome’ (see sidebar). Is it simply a matter of a horse not getting enough groceries, or is it health-related, such as a dental issue? In those cases, all we usually need to do is safely increase the calories the horse is consuming, relative to his daily expenditure. 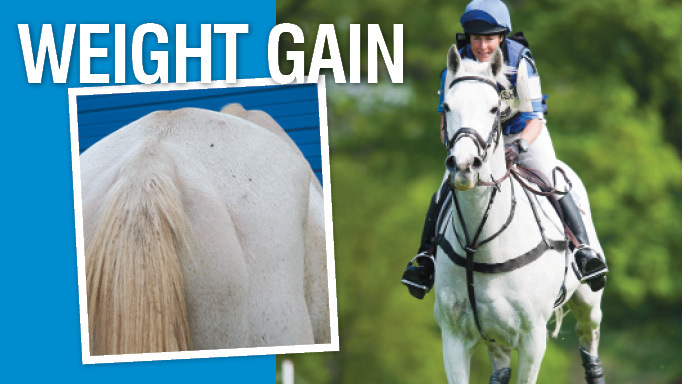 Another tip for weight gain is looking at the horse’s management. How many meals per day is he fed? Simply adding one more meal per day (late night dinner in addition to breakfast, lunch, and dinner) can significantly increase the calorie intake without having to increase meal size. There may also be situations where a horse’s energy expenditure will need to be decreased, such as limiting his workload, exercise, and competition schedule. Perhaps working with a behaviourist to address stereotypic issues that burn calories will allow the horse to relax and consume enough calories for it to gain weight. In terms of increasing calories (energy) in your horse’s diet, consider the different sources of energy a horse can consume – simple carbohydrates such as starches and sugars; complex carbohydrates in the form of fibre; fat; and protein. Because of differences in how these are digested and metabolized to produce energy, these compounds have different amounts of digestible energy – the amount of energy that is actually digested and available to the horse. 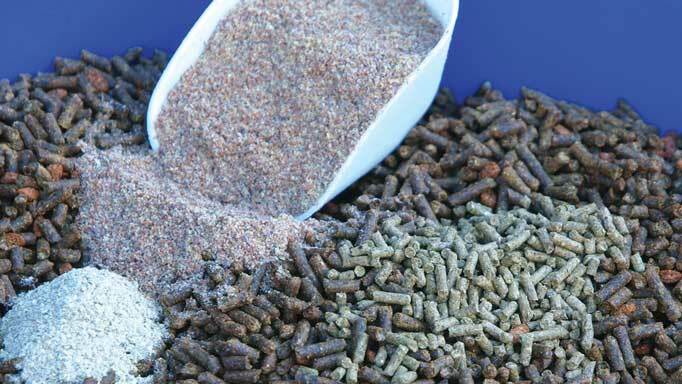 Most feeds a horse consumes has a blend of all of these components. Fat has the most digestible energy per unit weight, about 9 mcal/kg, and fibre has the least, with grass hay having about 1.8 mcal/kg. Protein can be digested and metabolized for energy, but it is actually a very inefficient source of calories – not to mention expensive! Simple carbohydrates also have good amounts of digestible energy. Most cereal grains have about 3 -3.5 mcal/kg, commercial mixes may range from 3.5-4.4 mcal/kg, but feeding large amounts of grain can be dangerous for the horse, primarily due to the increased risk of colic. The first way I like to increase calorie intake is to simply offer the horse more forage, such as hay. 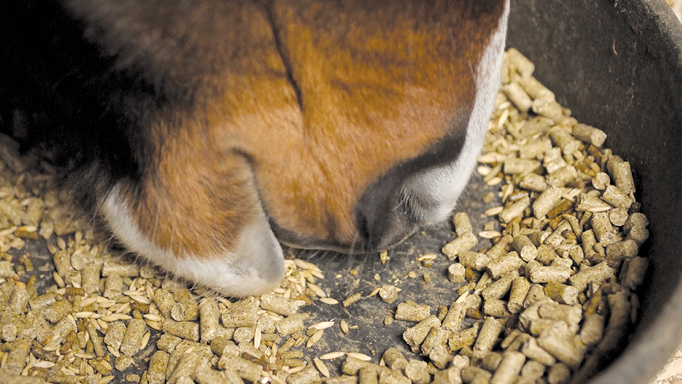 Ideally, horses should have free-choice access to hay, and while hay is highly fibrous and relatively low in digestible energy per kilogram, horses can eat a lot of it safely, and for that reason it should always be considered the first step. If a horse has maxed out his hay intake, I also like to look at other high-fibre choices such as pasture, if available and if not too lush. Other possibilities include hay cubes (I’ve seen horses turn away additional long-stem hay, but willingly eat more hay cubes), beet pulp or rice bran. These latter two are highly digestible fibre sources, with rice bran having the additional benefit of some extra fat. Another strategy for increasing calories is to increase the fat intake. Fat has more than 2.5 times the calories of most grains and is safe for horses to eat in relatively large amounts (considering a ‘natural’ diet is very low in fat, and horses lack a gall bladder). Vegetable oil is the cheapest and easiest way to increase calories in a horse’s diet, but only if increasing the hay offered has not shown sufficient improvement. If horses won’t eat oil as a topdress, there are some commercial high-fat products available that may be more palatable. Look for one that is more than 60% fat. I would rarely suggest simply increasing the grain ration, as previously mentioned, high grain intake increases the risk of colic. Furthermore, if you increase the amount of a commercial grain, you’re also feeding more of the vitamins and minerals that are within it, perhaps to excess. As always, work with your equine nutritionist or nutrition-trained veterinarian for feeding advice. 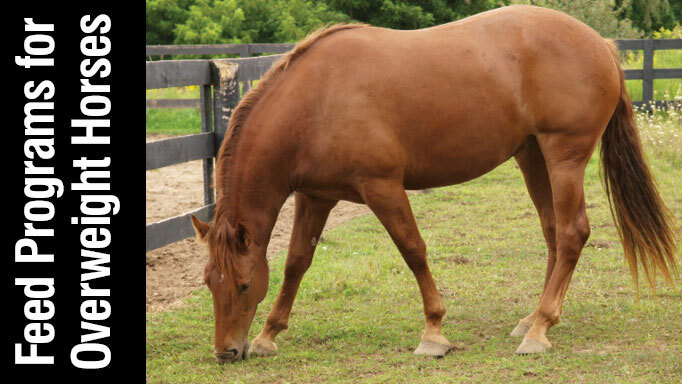 Shannon Pratt-Phillips, PhD, explains how to help your horse shed unwanted pounds. Are Genetically Modified Horse Feeds Safe?